More 2 Stars chefs here. Other Chinese chefs here. First of all, he has garnered the 2016-18 Michelin two star awards. 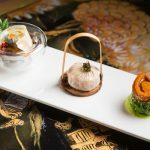 Also 2017 Asia’s 50 Best Restaurants recognition (No. 35) or 2014-17 Forbes Travel Guide Five-Star awards. On top, SCMP’s 100 Top Tables 2014-17, and Food & Wine Magazine’s award ‘50 Best Restaurants 2013’, amongst many others. The restaurant was also on the Top 20 Restaurants list of Hong Kong Tatler’s Best Restaurants guides 2014-18. Furthermore, Chef Tam is also overseeing one-Michelin-starred Chinese restaurant Pearl Dragon at Studio City. 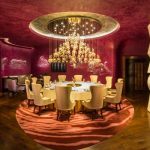 Previously, he also oversaw Ying at Altira Macau, another world-class hotel property operated by Melco Resorts & Entertainment. 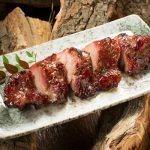 There, he attained one star rating in the MICHELIN Guide Hong Kong Macau in 2009 and again in 2017-18. Chef Tam Kwok Fung brought to Ying unequaled skills in Chinese cooking earned throughout over 30 years of experience in Cantonese fine dining. His culinary career has seen him work across China, Hong Kong and Thailand. There he routinely prepared a variety of traditional and contemporary Cantonese dishes for the royal families of Thailand, Japan and Nepal as well as a host of politicians and presidents. 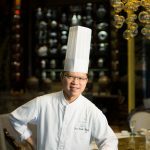 Chef Tam was Executive Chinese Chef at The Peninsula in Bangkok from 1999 to 2005. Under his helm, the hotel’s Mei Jiang restaurant was repeatedly named “Best Chinese Restaurant” by Metro magazine magazine. In 2005, Chef Tam was also awarded with Gold Medal at the fifth World Championship of Chinese Cooking (arguably the most preeminent award for Chinese cooking). Jade Dragon’s swift ascent was by no accident. 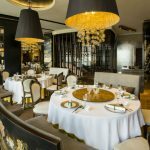 From its opening in 2012 on second floor of the Crown Towers Hotel within the City of Dreams casino complex, to its first Michelin star recognition in 2014, followed by its second in 2016. But even prior to that, he had already had a budding interest in food. Indeed, as a teen and previously worked part-time in a cafe in high school, making sandwiches and pasta. After taking on a job as a cleaner, he worked his way up the ranks, across different stations in the kitchen, even running staff meals for his colleagues. “Everything I know about cooking, I picked up one lesson at a time,” he adds. He is dedicated to producing authentic flavors. 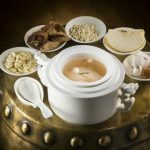 And to preserving the body’s balance and health as enhanced by the finest organic produce and extraordinary traditional Chinese culinary techniques. Little wonder that one of chef Tam Kwok Fung’s most popular signature dishes at Jade Dragon is fish. Made of a wild caught local species, Macau sole, the fish meat is fried to a golden crisp. “I would call it ‘complete’, this is also what tradition calls for. Whether it’s wok-frying or double-boiling, as a Cantonese chef, I will draw on these techniques – and the freshest seasonal ingredients as I mentioned before – to bring a dish to its most complete and most perfect expression. Besides being complete, innovation is also key. This is something we strive for in the kitchen every day,” chef Tam Kwok Fung says. Over the years, his passion for cooking has only grown. He joined Wynn Palace just last July 2018, where he has already injected his brand of modernity in Cantonese fine dining, ie. the most refined fried bread or mantou served with perfectly roasted chicken (the crispiest skin) topped with black truffles from Tasmania, double-boiled winter melon soup served in a whole winter melon (from Guangdong) where you are advised to spoon the actual gourd to mix in with the flowers, crabs and soup; and yes, his famous barbecued iberico pork has moved with him! More 2 Stars chefs here.